surroundings usually do the trick and it’s this last one whereby The Prestonville Arms on Hamilton Road came to my rescue. Gravy (£1.50). Even better if you are in a bit of a rush or fancy just grabbing some food to go, all of it is offered as a takeaway and comes in a fair bit cheaper. smeared in the creamy yet fresh-tasting mushy peas. I was also incredibly impressed with the gravy Fish and chips often get palmed off with the really cheap, gluey stuff however this was wonderfully beefy and had a beautiful pour. comforting taste of a really good dessert. Bravo to Craig – chef extraordinaire! Buttered Greens, Root Veg Mash, Giant Yorkshire Pudding and Gravy (£14) and ample veggie options for the non-carnivorous amongst us. The pork fell apart with each jab of the fork and the crackling was crispy and moreish. Perfect potatoes that were crunchy on the outside and fluffy on the inside, expertly cooked al dente veg, a particularly cheesy cauliflower cheese and a scrumptious yorkie. I saw a table who were particular fans of the beef gravy ask for a bit extra and I liked how friendly and enthusiastic the response was, especially when some pubs can look a little surly at such requests. 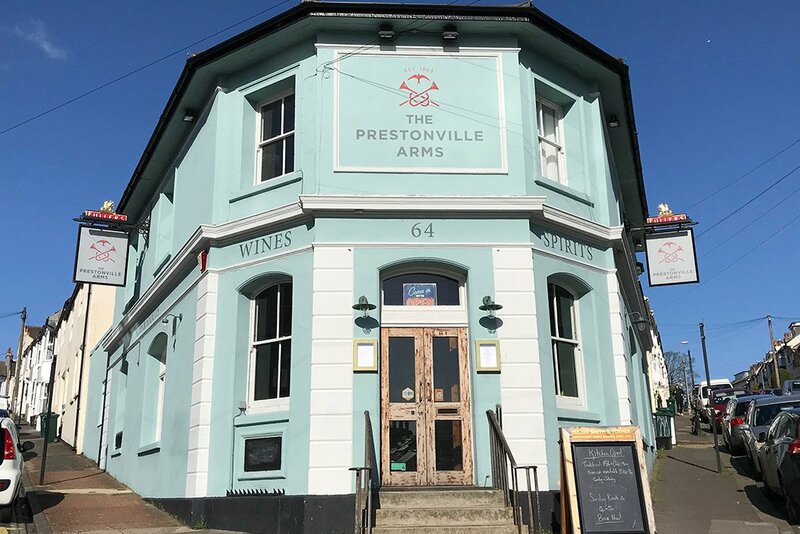 After experiencing two really lovely meals at The Prestonville Arms it’s safe to say this won’t be the last time they see my cheeky face, and I suggest if you haven’t been yet that it jumps to the top of your list. The Prestonville Arms will also be on the Artist Open House trail during May. So be sure to pop in for a drink and admire the art on display.